Yes, you read that right. We spent two weeks traveling through Norway, one of the most expensive countries in the world, and spent 5000$ on it. 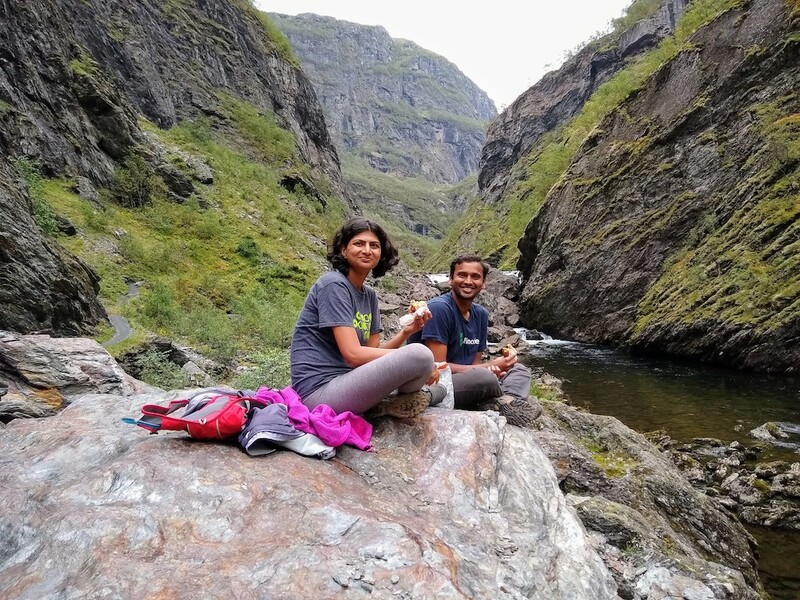 We didn't compromise and saw all the attractions we wanted to, starting from hikes like Kjeragbolten and Trolltunga, to glacier views at Nigardsbreen Glacier, to the world-famous UNESCO Heritage Site Geirangerfjord, to three beautiful days exploring the city of Oslo. We also rented a car, and the price of 5000$ includes the car rental and our to-fro plane tickets from USA to Norway. We learnt that despite what the world tells you, traveling to world-famous Scandinavian destinations can be done without breaking the budget. Here's a quick run down of how we did this. There are a zillion different ways to plan for a trip. I've had my share of not-so-great experiences when I've done last minute planning for a trip (see: Costa Rica). Landing at a place and going to the first attraction that you see, and later realizing you over-paid for the experience is not a nice feeling. Over the years though, I've learnt my lessons and optimized my strategies. For Norway, I rented the Lonely Planet's Norway travel guide (2018 version) from SFPL (San Francisco Public Library) for free, and used that to plan our itinerary for the trip. I also referred to multiple blogs; but the book had more information than most blogs. I chose Lonely Planet's guide because we got a Lonely Planet's guide from a friend for our trip to Iceland and loved it. So we knew Lonely Planet did a fine job with Scandinavian countries. I re-rented the book again, and we took it to Norway and referred to it multiple times during our trip, which helped make our travel experience more enriching. My point is, think outside the box, and use the resources already available to you! We got complete value from the travel guide without paying anything for it. You can rent camping gear from stores like REI or Sports Basement, or try to borrow from family and friends. We took a all weather 2-person tent for rent from Sports Basement and it cost us 57$ for two weeks. We did not find a way to rent camping gear after you land in Norway, so we packed our essentials before going. The only hard part about camping was the occasional rain we experienced. The inside of our tent never got wet; but setting up or getting into the tent when there was a downpour was a little adventure in itself. But what's life and travel without a little adevnture thrown into the mix, huh? Food in Norway is expensive. I get it, Norway is a cold country and not a lot of vegetables grow there. As much as exploring local cuisine is a way to understand a country's culture, you may not always want to do that. It could be budgetary constraints, or you might be bored of eating the same cuisine for multiple days. Cooking at camp kitches is neat alternative. Not only do you get to eat a freshly-cooked hot meal made the way you like, you also get to meet with other travelers and learn about new places. We explored a National Tourist Route simply because of a recommendation we got from a fellow camper after meeting them in the camp kitchen. We purchased fresh salmon and shrimp from local grocery stores and cooked them more than a few times. We also ate all the local delicacies like reindeer, whale, smoked salmon and crab cakes at various places during our trip. How can renting equal saving? Let me tell you. If you wouldn't rent, you'd either need to hitch-hike (loss of time) or take a combination of public transportation + taxis (loss of time and money), especially when you need to go to remote trailheads or new towns. The loss of time was a deal-breaker was us, since we were on a two week trip. Bonus points if your car can double up as a van, allowing you to sleep inside, which is what we did in Iceland. That way, you can also save money on accomodation. If you can afford it, you should consider renting an electric vehicle in Norway. This is a triple win. You get to explore a local grocery store and learn more about Norwegian culture (did you know that Norwegians cut freshly baked bread on a machine at the grocery store, and not purchase pre-cut bread?) when you are buying stuff from the store, eat a packed sandwich at a gorgeous scenic location on your hike and save money? It is simply an offer too good to refuse. Use Google Fi for phone-calls, messages and internet; it costs 30$ per month for 1GB data. Pre-download offline google maps on your phone for location and GPS information so you don't need to rent a GPS device. Have you traveled to any expensive countries on a budget? How was your experience? Living in San Francisco for over six years, I've had the opportunity to explore many hikes around the region. My favorite are coastal hikes, where I can see and enjoy stunning ocean views.